Fashion is all about making big, bold style choices. That can mean mixing prints, loading up on accessories, or going all out with bright colors. However, the most fashionable look of all is owning your style and feeling comfortable in your own skin. Proprietor of Lanidor Ladies Fashion Ireland, Caroline McCarthy, wholeheartedly agrees with this sentiment as she sat down with the Galway Advertiser to chat about how she got involved with Portugal’s largest brand of women’s clothes, following her dream, and the future plans she has for Lanidor in Ireland. “I was on holidays in Portugal and came across a Lanidor store in the city of Portimão and I really liked the look of the shop and loved the window display,” says Galway native, Caroline McCarthy in Lanidor’s beautiful, chic boutique on Eyre Street. “So I went in, had a look around, and really liked the clothes. The quality of the clothing stuck me initially. It was very good quality but very well priced. I did not know anything about the Lanidor brand until then; I had not even heard of the brand but it was really love at first sight. However, Caroline’s disappointment soon faded as she realised that there was a great opportunity. “I decided to research the brand and discovered it is available in about 100 stores worldwide and because of the quality and price, I believed it would be a great fit for Galway because Lanidor’s style has such great colour and vibrance and I thought its uniqueness would work well with a city known for its own distinctive energy and colour. Founded in 1966, Lanidor created the ‘LA LIFE STYLE’ with its vision of ‘making people happier’ as its continual inspiration, and at the store on Eyre Street, Caroline guarantees that there is something for everyone for every occasion. “People will come to us looking for an outfit for a Communion or a wedding, or even an awards ceremony so we will find something to suit you and your occasion. Our vision is to provide a wide selection of the Lanidor brand, which will range from dresses to jackets and jewellery to handbags. “At present, we have our spring/summer collection on show which really is beautiful, bright, fresh, and vibrant. The collection is really wearable and different. The colours and patterns are something you will not see anywhere else in Ireland. We are very unique. I do not buy in 100 of one particular dress. I buy limited quantities of each item so that it will retain its specialness and uniqueness. Caroline’s enthusiasm for the brand is positively infectious and her knowledge of the business belies the fact that this venture is her first foray into retail. Working as an executive assistant to various CEOs in London, New York, and Ireland, including 14 years in Creganna Medical, Caroline reveals that running her own business was always a path that she wished to travel. “Yes I am a first time entrepreneur. I had worked as an executive assistant and as a freelance makeup artist for several years but I had always wanted to run my own business and throughout my career, at various times, I had thought about stepping out and trying something entrepreneurial. But there was nothing that jumped out at me that I wanted to follow through or that I believed would work. And those plans are very exciting indeed for Caroline and the Lanidor Ladies Fashion Ireland team. 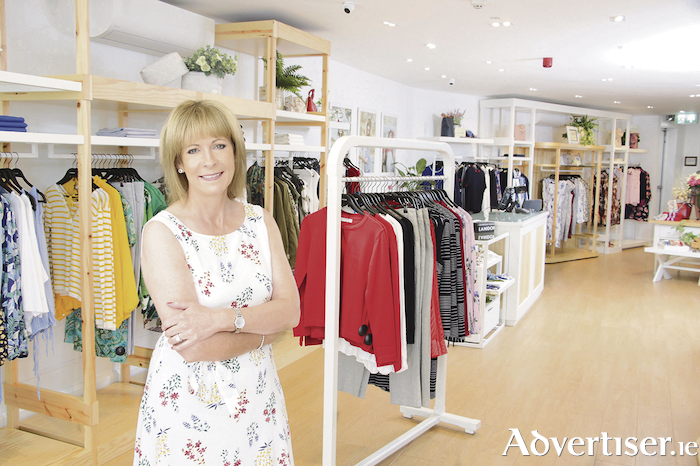 “I am looking to expand the brand Lanidor in Ireland,” says Caroline. “The first eight months have been superb here in Galway. We have had great feedback from our customers and we are extremely happy with how the store has performed. Lanidor thanks its customers for their support over the past eight months and looks forward to seeing them in the future. For more information call 091 568968, visit www.lanidor.ie, email [email protected], or check out its social media pages on Facebook, Twitter, and Instagram. COFFEE CULTURE MEETS COCKTAIL HOUR FOR THE TIA MARIA COFFEE REVOLUTION AT CAPRICE! Page generated in 0.1571 seconds.